I was recently inspired by kale I had at a restaurant....challenged actually. How was it that none of the kale I had ever made tasted even close to this? I actually liked it so much that I stole some from my friend's plate next to me, took it in a doggie bag and at around midnight enjoyed a snack of this awesome kale dish. So I set out to recreate the best kale I had ever had. 2 sticks of sausage, removed from it's casing and crumbled. Add kale to an extra large skillet with about 2 cups water. Let the kale start to cook down. Once water is gone add mushrooms, chopped garlic, onion and 1-2 more cups water. 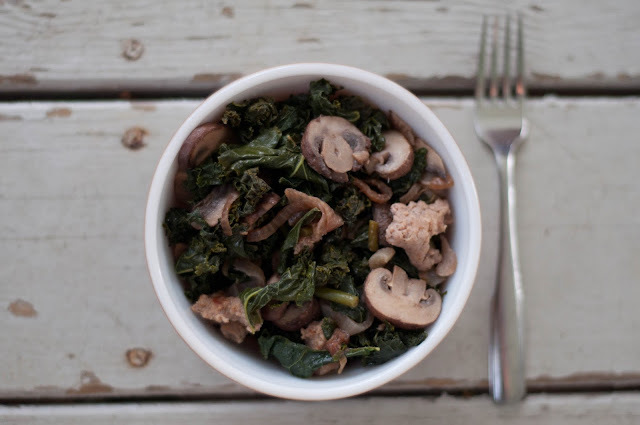 Cover skillet and let these items all cook together until mushrooms are tender. As the water gets low add the butter and stir. Once butter is melted add the sausage and you're done. Put it in a bowl and feast.